good review! 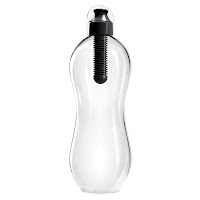 I've just bought the bobble bottle. (18.5L OZ) And I find that there are black particles (fro the filter) in the water. Do you worry about it? Good question! When the filter is new, it may have the carbon dust which can make it look like it is dirty. Make sure to fill it up and squirt out all the water a few times first to clear out any loose carbon particles. After this has been done, it should not get into the water anymore.